Background: Many materials are unsuitable for medical use because of poor biocompatibility. Recently, advances in the high throughput synthesis of biomaterials has significantly increased the number of potential biomaterials, however current biocompatibility analysis methods are slow and require histological analysis. Methodology/Principal Findings: Here we develop rapid, non-invasive methods for in vivo quantification of the inflammatory response to implanted biomaterials. Materials were placed subcutaneously in an array format and monitored for host responses as per ISO 10993-6: 2001. Host cell activity in response to these materials was imaged kinetically, in vivo using fluorescent whole animal imaging. 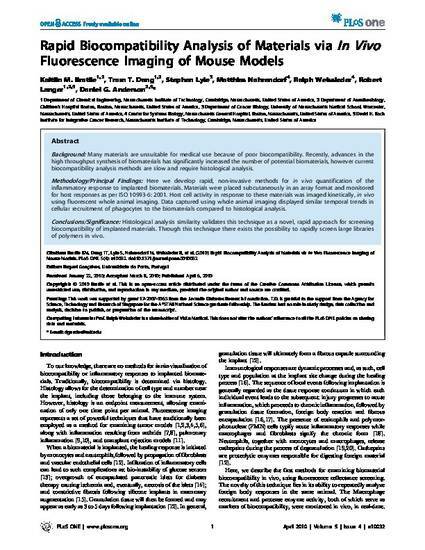 Data captured using whole animal imaging displayed similar temporal trends in cellular recruitment of phagocytes to the biomaterials compared to histological analysis. Conclusions/Significance: Histological analysis similarity validates this technique as a novel, rapid approach for screening biocompatibility of implanted materials. Through this technique there exists the possibility to rapidly screen large libraries of polymers in vivo. This article is from PLOS ONE 5 (2010): e10032, doi10.1371/journal.pone.0010032. Posted with permission.